We enjoy spending time trying new toys and exploring new services to figuring out how we can make them work for us. We want to share this with you, our readers! 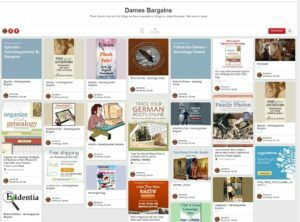 Jump on over to the Genealogy Dames Bargain pages to see what new toys and services we’ve been exploring. All prices and offers are subject to change. Some items may be sold out and have limited inventory. Also check to see if you have automated purchase settings enabled, such as Amazon Buy with 1-Click: it is your responsibility to make sure you are getting the correct price for an item before you check out and finalize the transaction.